It seems that Atari wasn’t content just partnering up with ThinkGeek’s iCade arcade cabinet for iPad. They’ve let slip the plans for an Atari Arcade joystick product in a link in the description of their Atari’s Greatest Hits app, reports Macrumors. Update below. The app is a collection of a ton of Atari’s games, one of which comes bundled with the iCade cabinet, which we reviewed here. 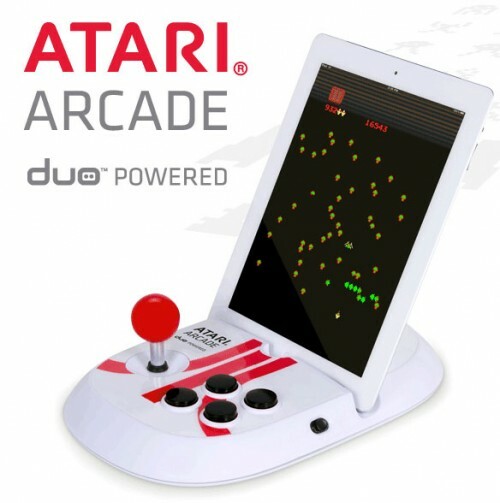 The collection is extensive and has been a relatively popular offering on the iTunes App Store, so Atari is looking to cash in themselves with the Atari Arcade “Duo Powered” joystick for iPad. A link in the description of the app seems to have outed the design. Unlike the iCade it looks to support both landscape and horizontal orientations and consists of just a base, rather than a full-cabinet setup. It is likely to connect via Bluetooth, like the iCade, rather than a dock connector. It also features only 4 buttons, which makes it fine for Atari games but leaves out others, like Street Fighter, that many of us have been hoping to see iCade-compatible versions of. I like the looks of it, it feels very ’80’s arcade’. I’d like to get my hands on one to compare it against the iCade, which I’m still enjoying. There is no pricing or availability information yet, but we’ll let you know when there is. Update: Dvice has a review up and says that the Atari Arcade will be available for $60 in October and that it uses a dock connector, not Bluetooth, meaning that it only supports portrait, not landscape orientations.